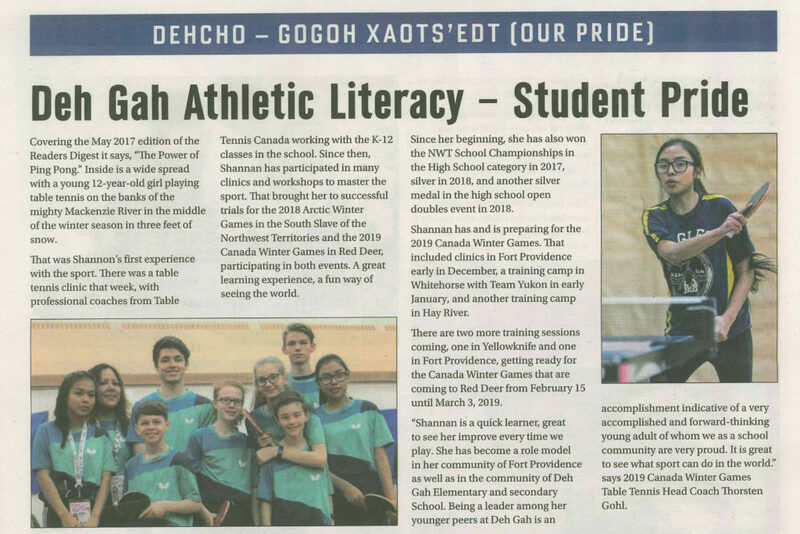 What a nice article in the Dehcho school newspaper, about 2019 Canada Winter Games – Red Deer Team NT Table Tennis athlete Shannan from Deh Gáh School in Fort Providence. Congratulations to Zachary Mathison for becoming Table Tennis North’s 2018 Player of the Year. The young, 9 years old, Zachary had a fantastic year in 2018. Qualifying for the 2018 Arctic Winter Games and winning all Territorial titles that he participated in. 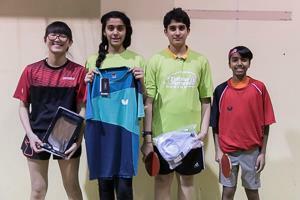 This included the Grade 8 singles event and the High School doubles tournament. 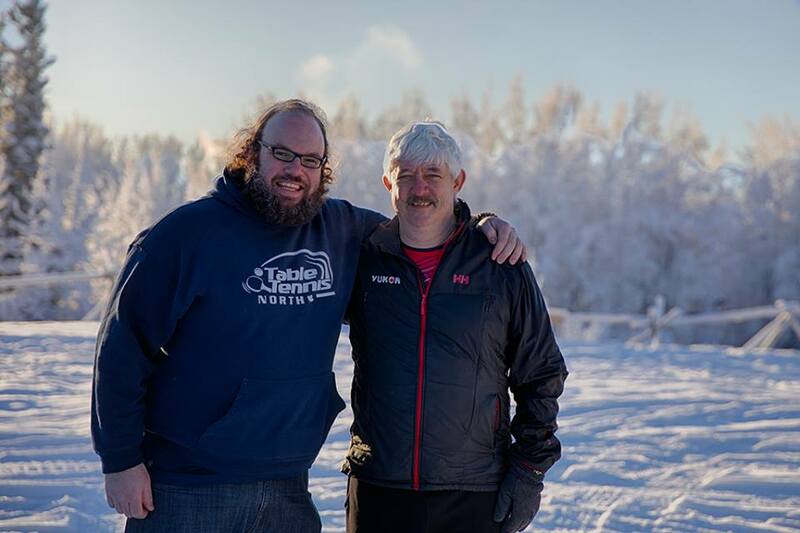 It was a fantastic trip for Team NT to the Yukon. An amazing start to work on inter-territorial events in the future, #TrueNorth. It is all about coming together, being stronger together, creating opportunities and possibilities. So great to see Team Yukon Table Tennis and Team NT Table Tennis building bridges, creating partnerships and making our sport stronger. 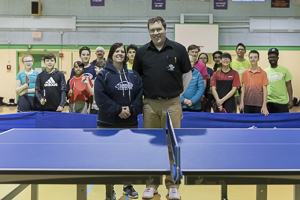 Congratulations to Shari Olsen from Fort Smith in becoming a Territorial Umpire for the Northwest Territories in Table Tennis. 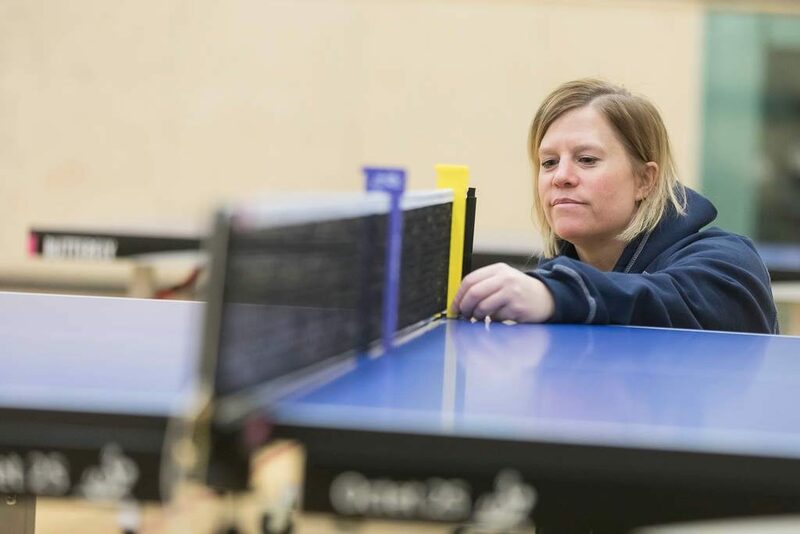 Shari only started with Table Tennis in 2018 but quickly learned about the sport. She officiated the Canada Games trials, the NWT School Championships and the “North of 60” challenge in Whitehorse, Yukon. Having done 100 matches in such short time, she is definitely going to be ready to umpire at the 2019 Canada Winter Games in Red Deer this February. 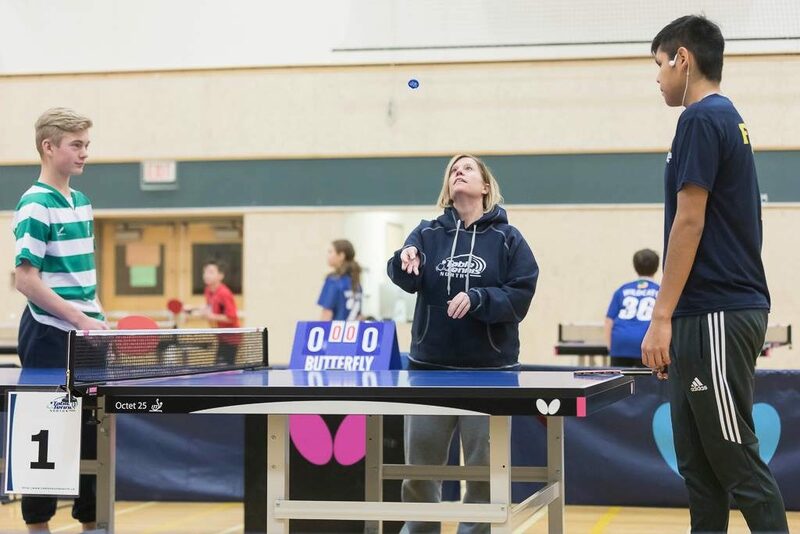 The Table Tennis event at the 2019 Canada Winter Games will be hosted in Red Deer, Alberta, from February 15-22, 2019. 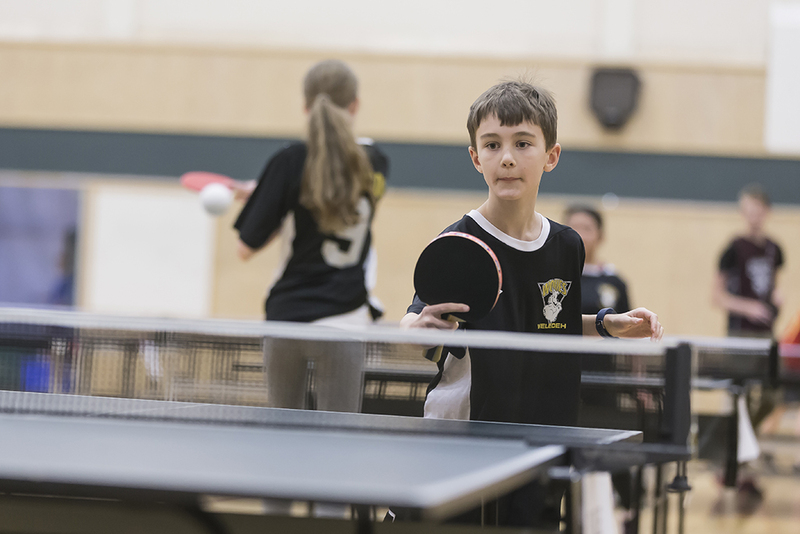 Table Tennis North will be hosting two trial weekends with a total of 1 officials clinic, 4 morning skills camps and 4 afternoon tournaments. The top 3 spots will be given to the top 3 ranked players in each category. Each athlete will need to fill out a QUESTIONNAIRE about Table Tennis and submit it prior to the first skills camp. Athletes will to have to pass the umpire exam. This can be done ONLINE via Table Tennis Canada or on October 12, 2018 (Fort Providence). 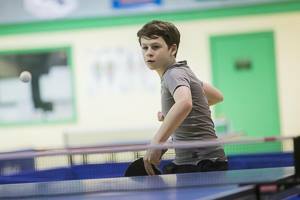 Table Tennis rules are available HERE! There is a fee of $100 for the trials, including all skills camps and tournament fees per athlete. 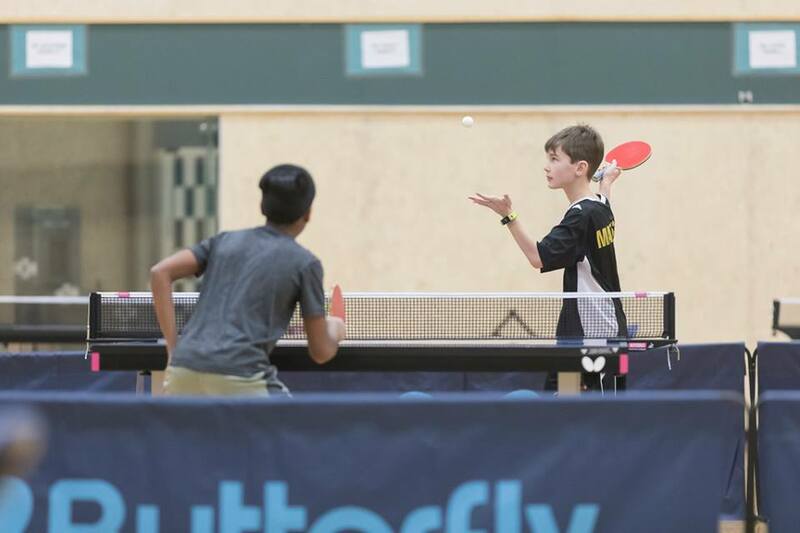 That does not include food or accommodation, but Table Tennis North can help and secure the accommodation. 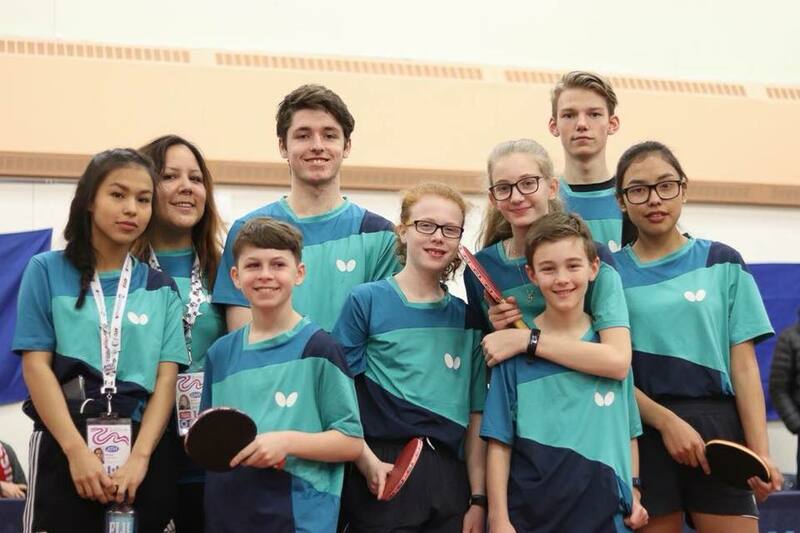 If successful, there will be an additional fee of $150 for the Team NT Table Tennis uniform, provided by Table Tennis North (each participant of the trials can purchase the set). 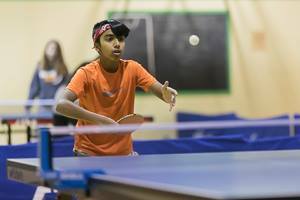 SIGN UP for the trials in sending the first name, last name, birthdate, community and contact e-mail/phone number to info@tabletennisnorth.ca by October 11th, 2018! Arrangements for accommodation can be made in Fort Providence at the school if a chaperone is present. HERE is the full selection policy. We are looking forward to seeing you in October in Fort Providence or November in Yellowknife. GO TEAM NT GO!!! 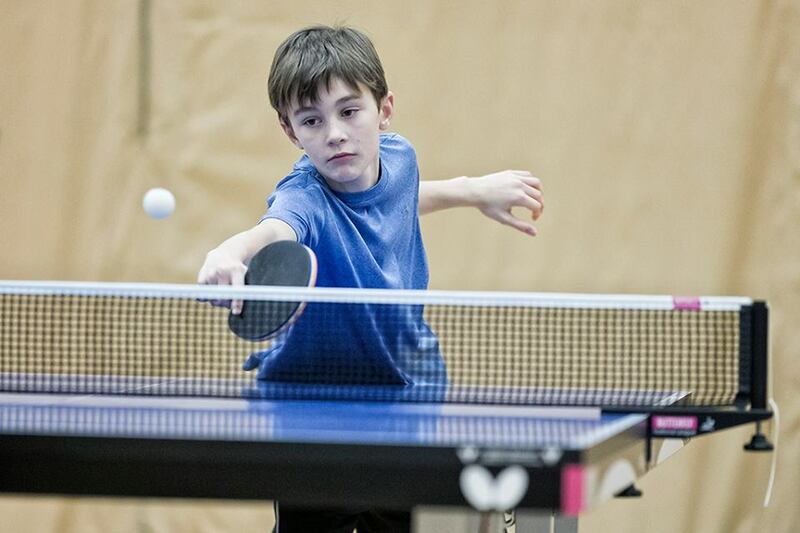 60 professional Table Tennis tables are now in our communities and see a lot of action. 15 communities have been engaged with Table Tennis. Our “Elders in Motion” program has been a huge success and we were allowed to speak at the NWTRPA conference this year on bringing Elders, Kids and the communities together. 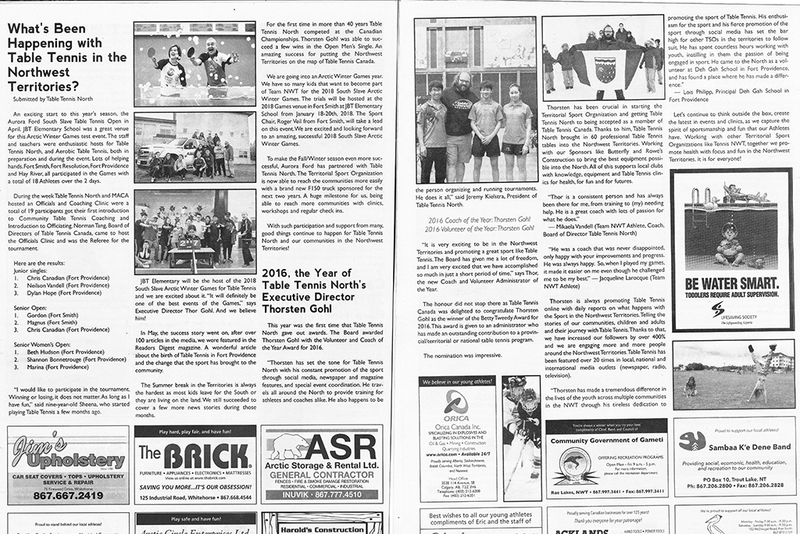 Readers’ Digest featured a full story on Table Tennis North, reaching across the country and beyond. 135 kids showed up to the 2017 Territorial School Championships. 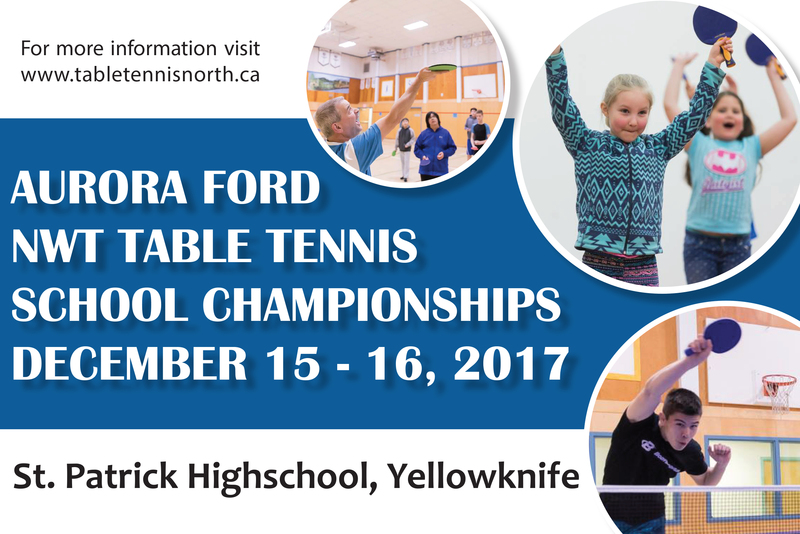 Aurora Ford has become a major sponsor for Table Tennis North. 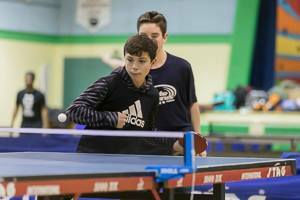 Table Tennis North has been back to the Canadian Table Tennis Championships since over 30 years and reached the Round of 32 in the Men’s Single event. Thorsten was named Volunteer and Coach of the Year by the Territorial Sport Organization. He also received the Betty Tweedy Award by Table Tennis Canada and the Contributor to Sport award by Sport North. Aurora Fraser and Tamara Jovic have been named the Team of the Year by Sport North. Just some of our many highlights of this year. Every time going into a gym, cafeteria, class room or really anywhere where we find a Table Tennis Table, is a highlight. 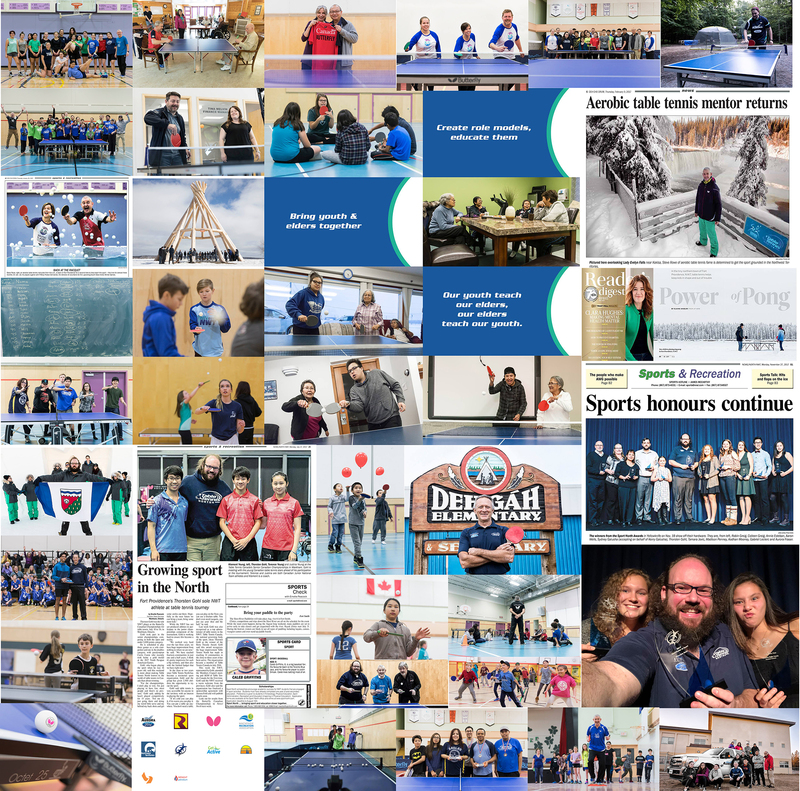 We are grateful for everyone that has been involved this year and we are excited looking forward to 2018 and the excitement that the Arctic Winter Games will bring. It’s the last territorial champion-ship of the calendar year and was one which provided the most unlikely of results. 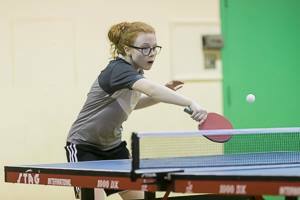 The NWT Table Tennis Championships were held at Weledeh and St. Pat’s Gymnasiums on Dec. 15 and 16 and Zachary Mathison of Weledeh Catholic School made sure people knew it doesn’t matter how old you are, but rather that you can play the game. And he did just that, winning the Grade 8 boys singles title. Not a big deal until you realize that Mathison is only in Grade 3. Mathison said it was a challenge, but nothing he couldn’t handle. “I wasn’t really nervous,” he said. 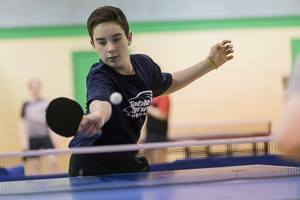 “The kids were just bigger, that’s all.” They were a bit bigger this time because the eight-year-old won the Grade 6 boys title last year as a Grade 2 student, but thought he could pull it off again this year. “I had some easy matches, some hard matches,” he said. Christopher Mathison went on to win the Grade 9-12 boys singles in the high school division to complete the family sweep, which helped St. Pat’s win the overall banner in that category. While Mathison was busy dom-inating Grade 8 students as an eight-year-old, there were other divisions up for grabs. St. Joe’s ended up winning the overall championship in the junior division thanks in large part to Alex Ramsey, Raine Mingo and Gracie Brennan winning the Grade 6 boys and girls and Grade 7 girls singles titles respectively. Mingo and Ramsey teamed up to capture the Grade 6 doubles title, which helped the school lock up the banner in their first year competing as a team. The overall banners were decided based on an aggregate system where the total number of points earned by a school through its results was divided by the number of athletes a school brought to produce an average score. Deh Gáh School in Fort Providence is hosting a Table Tennis skills clinic from November 11th until 13th. In addition we will be hosting a coaching & officials clinic on October 9th in preparation to the 2018 South Slave Arctic Winter Games. 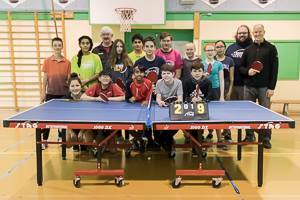 Table Tennis will be hosted in Fort Smith at JBT Elementary School from March 18-24th, 2018. Snowshoe Inn, Fort Providence, food will be provided at the school. Possibility to stay at the school. We will follow the rules of the International Table Tennis Federation. 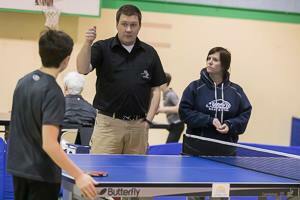 If you have any questions, please contact info@tabletennisnorth.ca and we will be happy to help you. Deadline for registration is November 9th, 2017. For registration, please send and e-mail to info@tabletennisnorth.ca with the following information: First Name, Last Name, Community and birthdate. If you have any more questions, please contact info@tabletennisnorth.ca. Thank you! We are looking forward to seeing you in Fort Providence!!! 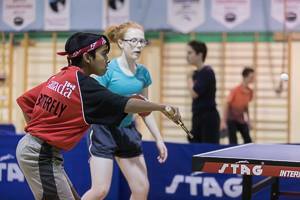 A fun read and you will be up to date on what is happening with Table Tennis in the NWT. The 2017 Territorial Championships will be hosted from December 15-16th 2017 at St. Patricks in Yellowknife. There is a $15 per category fee to participate in the tournament. That does not include accommodation and food for the weekend. You can participate in 2 categories, 1 single, 1 double. If you like to stay at the school, please contact us. Deadline for registration is December 1st 2017. For registration, please send and e-mail to info@tabletennisnorth.ca with the following information: First Name, Last Name, Community, Birth Date and mention what categories you want to participate in (max. 2 categories). Also, please let us know if you want to stay at the school. If you have any more questions, please contact info@tabletennisnorth.ca. Thank you! We are looking forward to seeing you in Yellowknife, December 15th, 2017.